The Royal Backpack is perfect and practical for all occasions! A day hike, travel adventures or as your daily school/university/work bag. Packed full of features like secret compartments, a padded laptop section, water bottle holders and even a pen organiser! 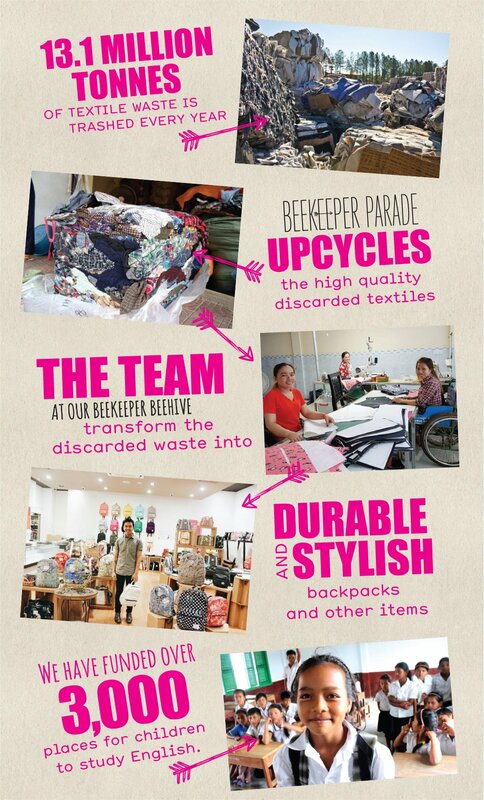 Each bag is upcycled from end-of-roll, remnant, discarded or donated fabrics and clothing. Literally one of a kind! Buying this product = 129 Reward points for Members. Your cart will total 129 points = voucher of $6.45. Not a Member? Join at checkout to claim these points. BEEKEEPER IS A SOCIAL BUSINESS HATCHED BETWEEN A BROTHER (KOKY) AND SISTER (SOPHIA) IN 2012 WHILE SOPHIA WAS IN HOSPITAL FIGHTING CERVICAL CANCER. "It was with the heaviest of hearts that we experienced the loss of Sophia on the 15th of August 2012, after an 18 month battle. We still feel her absence with such acute rawness. In her will, she left her car to her brother Koky, with instructions to sell it and use the money to create a business that would inspire change and help support the continued work of BabyTree Projects, a charity they founded together to fight for children’s rights and to bring quality education to the doorsteps of children in rural Cambodia. Since that time, Koky has dedicated his life to making sure that he keeps his promise to his sister. To this end Boy & Bee was born in 2012, and in 2014 we decided to change the name to BeeKeeper. And the Sophia Saly School was built in 2014, in a coastal village right near the sea. Koky recruited a team of talented individuals to help him grow the Beekeeper hive. Big bee introductions must go to his merry band of keepers. Anthony Guardabascio (brand keeper), Lana Sadie Laham, Lachlan McIntosh, Theodore Buscemi, Laura Abela, V-ann Tan and Costa Theodorakopoulos." Our mission is to create products that change the world, do no harm to the environment, nourish and support the people and animals that dwell on our planet, to seek solutions to our environmental crisis, to use business to inspire people to consume less, to do more and BEE MORE and to support BabyTree Projects in its fight for quality education for all children. Note: As each product is totally unique, prints might vary slightly in how they appear on each bag. Fun and upcycled inner and outer fabric! Two side pockets that can hold 750ml bottles. Don't want you to get dehydrated! As each bag is totally unique and made from upcycled fabrics, we can not specify exact fabric content. Please note: Linings can be different depending on what materials they have on hand at time of production. Spot clean with warm water and mild (hopefully eco friendly) detergent. Air dry. Do not bleach, iron or dry clean. Made in Cambodia at the BeeKeeper Parade 'Imaginarium' Production House.